publish in Images on April 6th, 2008 by tiki god | Report This Post | Click to Add to favorites | Tags: Humor, Science! Wow! A million miles an hour? I think that’d start to rip apart things. 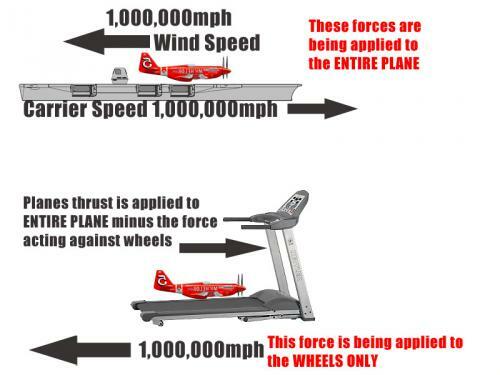 At a 100,000,0 (hahah) miles an hour the plane will be ripped to shreds by the wind. it will take off though. or be torn off. The real question is if the force being applied to the wheels is strong enough to pull the plane backwards – pretend the engine is off – if the plane is pulled back, it ought to be possible to make it such that the engine is not strong enough to overcome the backwards pull. At 1,000,000 mph, it probably is, thought the wheels would probably fall off first. Forces? What the f@#k does that mater? The ONLY thing that matters is airspeed. If the plane is traveling forward fast enough relative to the wind it will take off regardless of what the ground is doing. Sweet chocolate Christ let this thing die. If the treadmill was moving fast enough that the friction in the wheels was enough to match the thrust from the engine moving forward, the heat would probably cause the plane to melt. 1,000,000 MPH would be enough to get a scramjet off the ground. Literally. Just start the engine. I run on my treadmill at 1,000,000 mph but I do not put my toy airplanes on it that fast. No way.